(Re)Building a Kidney is a National Institute of Diabetes and Digestive and Kidney Diseases-led consortium to optimize approaches for the isolation, expansion, and differentiation of appropriate kidney cell types and the integration of these cells into complex structures that replicate human kidney function. The ultimate goals of the consortium are two-fold: to develop and implement strategies for in vitro engineering of replacement kidney tissue, and to devise strategies to stimulate regeneration of nephrons in situ to restore failing kidney function. 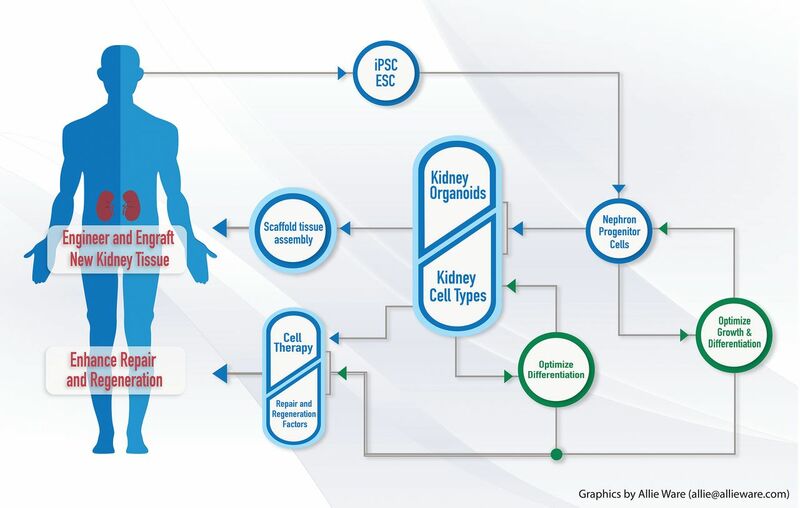 Projects within the consortium will answer fundamental questions regarding human gene expression in the developing kidney, essential signaling crosstalk between distinct cell types of the developing kidney, how to derive the many cell types of the kidney through directed differentiation of human pluripotent stem cells, which bioengineering or scaffolding strategies have the most potential for kidney tissue formation, and basic parameters of the regenerative response to injury. As these projects progress, the consortium will incorporate systematic investigations in physiologic function of in vitro and in vivo differentiated kidney tissue, strategies for engraftment in experimental animals, and development of therapeutic approaches to activate innate reparative responses. By current clinical definitions, approximately 10% of the adult population of the United States suffers from CKD.1 Epidemiologic studies suggest a similar incidence worldwide, and as populations age it is clear that finding new therapies for kidney disease is a global health care priority.1 Kidney disease and injury affect diverse renal structures. Some, such as the proximal tubule, are regenerative and show highly proliferative responses to injury,2,3 whereas others, such as glomerular podocytes, do not.4 Recent advances in our understanding of tissue regeneration, stem cell biology, and bioengineering make it feasible to develop new strategies for restoring kidney function. The (Re)Building a Kidney (RBK) consortium (www.rebuildingakidney.org) was formed by the National Institute of Diabetes and Digestive and Kidney Disease (NIDDK) in 2015 to coordinate and integrate research on strategies to restore kidney function on the basis of our understanding of kidney development, and the response of the adult organ to injury. The consortium focuses on two fundamentally different but complementary strategies that have the potential to transform our approach to treating kidney disease and solving the kidney shortage crisis. The first is to engineer and engraft new kidney tissue. The second is to identify endogenous repair and regeneration processes in the injured kidney that can be exploited therapeutically. As depicted in Figure 1, the RBK aims to develop the tools, resources, and knowledge to (1) characterize fetal and adult human kidney cell types to determine which cellular phenotypes should be targets for directed differentiation of human induced pluripotent stem cells (iPSCs), (2) produce and characterize human kidney progenitor cells from pluripotent cells while optimizing systems for their propagation, (3) generate complex and well organized kidney tissue through controlled differentiation of natural and iPSC-derived kidney progenitor cells, (4) use biologic scaffolds to promote tissue assembly and growth, (5) connect filtering nephrons to tubule networks to act as conduits for urine, (6) interrogate the potential of cell therapy to repair kidney damage, and (7) exploit endogenous repair mechanisms in the adult human kidney to enhance regeneration. The RBK Consortium is taking multiple approaches to achieve its goals of engineering and engrafting new kidney tissue as well as enhancing kidney repair and regeneration to restore kidney function. (1) iPSC/ESC > NPCs: propagating human progenitor cells in their undifferentiated state and using them to generate kidney cells and organoids, populate tissue scaffolds, and recellularize kidney matrix are key goals of the RBK consortium. Starting with iPSCs or established ESC lines, NPCs will be generated using differentiation protocols for nephrogenic mesoderm. Propagation and self-renewal of these cells and mouse cap mesenchyme NPCs will be optimized using transgenic reporters of the progenitor cell type, quantitative RT-PCR of qualified human marker genes, and single-cell mRNA phenotyping as end points to detect expansion of the progenitor cell type. (2) Kidney organoids/kidney cell types: differentiation of self-organizing organoids or directed differentiation of individual kidney cell types will also be achieved by optimizing medium conditions and assaying outcomes using cell-type specific fluorescent protein transgenic reporter iPSC/ESC lines, quantitative RT-PCR of qualified human marker genes, and single-cell mRNA phenotyping. Fluorescent protein reporter human iPSC lines will also allow live imaging of ex vivo kidney differentiation as well as reisolation and transcriptional profiling of organoid-derived kidney cells, including nephron and stromal progenitors, podocytes, proximal tubules, distal tubules, and endothelium. Rigorously defined human kidney cell transcriptional signatures as well as cell injury markers derived from single-cell RNA sequencing and MARIS will be essential for organoid and cell type quality control and to establish baseline phenotypes for further functional characterization, disease modeling, and potential therapeutic use. (3) Scaffold tissue assembly: multiple approaches, including decellularized kidneys, silk, and synthetic polymers, and three-dimensional printed arrays of nephron tubules and blood vessels, will be tested to generate structures into which differentiated kidney cells or organoids can be seeded, instructed to differentiate, and interconnect nephron tubules to form functioning kidney tissue with the potential to replace failed kidney function. (4) Cell therapy/repair and regeneration factors: defined growth factor activities optimized for progenitor cell self-renewal and organoid differentiation as well as for directed differentiation of renal cell types will be integrated into new approaches to promote endogenous repair of nephrons. Adult kidney podocyte and interstitial progenitor cells will be profiled and characterized to develop new ways to promote endogenous repair. Contributions of nonepithelial cells, the endothelium, interstitium, and pericytes/vascular smooth muscle to kidney cell differentiation will also be assayed and modeled using fluorescent reporter lines and coculture with nephron cells in two-dimensional and three-dimensional cultures. ESC, embryonic stem cell lines. Within the consortium, protocols on the basis of recapitulating renal development have been adopted to coach human iPSC lines to form human kidney organoids.5–8 These organoids have been shown to contain all of the anticipated components of the fetal human kidney, including patterned and segmented nephrons, collecting ducts, renal interstitium, and endothelium (Figure 2).8 As with protocols for the directed differentiation of iPSC to other human tissues (reviewed in Clevers9), morphology and gene expression analysis suggests that kidney organoids represent first trimester human tissue.8 The presence of derivatives of all major progenitors (cap mesenchyme, ureteric bud, vascular progenitors, and stroma) suggests that these organoids could represent a promising source of human kidney tissue, although nephrons within the organoids are not fully differentiated and lack functioning vasculature. 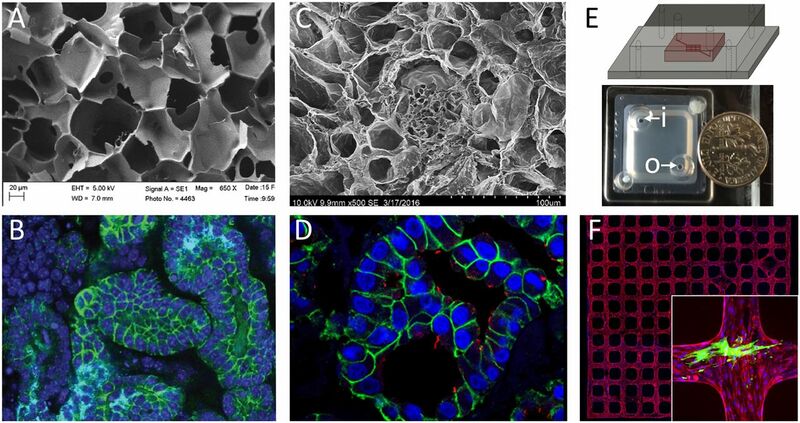 iPSC-derived kidney organoids contain all components of the fetal human kidney, including patterned and segmented nephrons, collecting ducts, renal interstitium, and endothelium. Comparison of mature and developing cell types between normal human fetal kidney (left) and iPSC-derived kidney organoids (right). Structures: CD, collecting duct; Endo, endothelium; Glom, glomerulus; PC, perivascular cell; PT, proximal tubule; SSB, s-shaped body nephron; STR, stroma. Markers: CALB1, collecting duct in early kidney and mature distal tubule in nephrons; CD31, endothelial cells; CUBN, proximal tubule; DAPI, nuclei; ECAD, distal epithelial cells; GATA3, collecting duct; KRT8, collecting duct in early kidney and mature distal tubule in nephrons; LTL, proximal tubule; MAFB, podocytes and glomeruli; MEIS1, interstitial cells; NPHS1, podocytes; PAX2, collecting duct and nephron; PDGFRA, pericytes; SOX17, endothelial cells. Images of human fetal kidney supplied by McMahon laboratory (Tracy Tran and Nils Lindström). Images of human iPSC-derived kidney organoid supplied by Little laboratory (Han Chiu, Minoru Takasato, Pei Er, Jessica Vanslambrouck, and Sara Howden). Key concerns in developing a directed differentiation protocol are robustness and reproducibility; i.e., it is essential to determine a differentiation strategy that can be transferred from one stem cell line to another with reproducible outcomes in terms of organoid gene expression profiles and cellular complexity. With these concerns in mind, substantial focus is placed on sources of variation and the transferability of the approach between iPSC lines. Within the consortium, a Quality-by-Design strategy is used to establish strict parameters for each component in the directed differentiation process.15,16 This strategy allows for >12 dimensions within a design space in which morphogens and growth factors are tested simultaneously and interactions between individual signaling pathways can be determined. The end point of the experiment is expression analysis of >50 markers of renal cell types, enabling evaluation of subtle differences between differentiation states. Robust differentiation protocols developed using this approach will be particularly important in disease modeling applications where uniform organoid composition is essential for reproducibility of high-throughput drug screening. Although the self-organization of the iPSC-derived organoid provides an attractive solution to generating tissue containing all relevant cell types in vitro, it may be difficult to generate sufficient tissue volumes using this method. A complementary strategy for building new kidney tissue is to recombine specific cell types of the developing kidney in appropriate proportions and in appropriate locations within biologic scaffolds. One possible strategy to generate the distinct cell types that are required is to isolate them from iPSC-derived organoids and devise culture methods to expand them. An alternate approach is to differentiate each of the individual cell types in isolation for use in building synthetic tissue. Protocols have been reported to differentiate ureteric bud cells,21 NPCs,6,22 podocytes,23 and tubular epithelial cells.24 To date, no attempts have been reported to recombine these distinct cell types to form kidney tissue, and this presents a fascinating future challenge for the consortium. Multiple different bioengineering approaches to generating tissue scaffolds offer unique advantages for rebuilding kidney tissue. Polymer-based (A and B), decellularized tissue (C and D), and organ-on-a-chip (E and F) approaches are shown. (A) Scanning electron micrograph of 6% silk scaffold before cell seeding; a network of channels is formed into which NPCs can be seeded. Photo: Jeannine Coburn. (B) E-cadherin (epithelial cells) and DAPI (nuclei) staining reveals a network of tubules with lumens within the silk approximately 2 weeks after seeding NPCs. Photo: Jessica Davis-Knowlton. (C) Scanning electron micrograph of decellularized kidney tissue showing the extracellular matrix framework for tubules and glomeruli. Photo: Joseph Uzarski. (D) Immunostaining of a decellularized kidney that has been recellularized with MDCK cells 7 days after cell seeding. E-cadherin (green) and luminal cilia (acetylated tubulin, red) demonstrate epithelialization. Photo: Joseph Uzarski. (E) Schematic and top view picture of a vascular network-on-a-chip device that allows flow through the network via inlet (i) and outlet (o). Photo: Zheng laboratory. (F) An example view of a three dimensional microvessel network formed by mouse kidney endothelial cells. Red: CD31, blue: DAPI. The inset shows fluorescence immunostaining of a device in which podocytes (green) were cocultured with the vascular endothelial network (red). Photo: Zheng laboratory. EHT, extra high tension voltage setting; WD, working distance. Each of these approaches has distinct advantages. Scaffolds made from silk are extremely robust, and can easily be sterilized by autoclaving, modified with growth factors, and manipulated for engraftment.25 Also, silk is in regular surgical use, suggesting minimal regulatory hurdles for clinical application. Printing of nephrons has the advantage that structures can be easily organized in the stereotypic pattern seen in vivo, which is important for physiologic function.29 Adult decellularized organs provide the complex extracellular matrix environment required for attachment and function of differentiated kidney cell types.27,30 Engineering the matrix to present growth factors in a spatially organized fashion provides another approach to drive organoid differentiation on a larger scale.28 The ultimate scaffolding solution may incorporate aspects of each of these bioengineering approaches. Further, it is important that the systems are also considered in the context of future needs in vivo to maximize translation potential for the work in the consortium. Development of renal blood vessels is essential for the generation of functional nephrons, whether within bioengineered tissue or organoids.31–33 Recent results reveal that there is a surprising heterogeneity in endothelial cell gene expression within the developing kidney. How spatial and temporal differences in endothelial cell phenotype might affect nephron progenitor self-renewal or differentiation is an important and understudied area. Furthermore, regeneration of the nephron will require both pericytes and vascular smooth muscle cells for stabilizing capillaries and larger vessels, respectively. The consortium is developing approaches for proper vascularization of organoids seeded in silk or other three-dimensional scaffolds by (1) generating primary and conditionally immortalized Gli1-positive mesenchymal stem cells (e.g., interstitial pericytes and perivascular fibroblasts), (2) developing methods for pericyte and vascular smooth muscle cell differentiation, (3) determining transcriptional profiles and molecular signatures of endothelial cell classes, and (4) identifying endothelial cell signals and crosstalk with interstitial and epithelial cells that affect kidney differentiation or proliferation within synthetic kidney tissue. The patterning of the kidney stroma and interstitium is likely to be an essential event in the functional development of the nephrons. The renal interstitium arises along the cortical–medullary axis from two distinct progenitor populations marked by Foxd1 and Tbx18; the Tbx18-positive population gives rise to the interstitium surrounding the ureter, the renal pelvis, and some of the papilla, whereas Foxd1-positive progenitors give rise to the remaining interstitium, including the pericytes, peritubular fibroblasts, and mesangial cells.34,35 Loss of the Foxd1-positive cell population affects the development of kidney tubules and vasculature nonautonomously,20 and it seems likely that different interstitial zones could establish distinct molecular niches, affecting the final differentiation and function of kidney epithelia and endothelia. Also, much of the endocrine function of the kidney, including the production of renin and erythropoietin, is performed by interstitial cells that must be recapitulated in efforts to engineer or regenerate kidney tissue.36 With the goal of understanding interstitial cell differentiation, fluorescent reporter mouse strains are being generated with the purpose of isolating interstitial cell types, and techniques are being developed for coculture with nephron and endothelial cells both in two-dimensional culture and three-dimensional silk scaffolds. Transcriptional profiles derived from interstitial cell subpopulations should yield important insights into interstitial cell patterning and signaling roles. To take full advantage of newly generated iPSC-derived replacement tissue to restore kidney function, filtering nephrons must connect to a collecting duct network to pass fluid. In kidney development, new nephrons derived from S-shaped bodies fuse lumens with the branched collecting system to generate functioning nephrons.37,38 The signals guiding epithelial cells to invade an existing tubule, rearrange cell junctions, and form a new patent lumen are not known. The regenerating zebrafish kidney provides a quantitative model to test signaling pathways required for tubule invasion and nephron fusion. After injury, the adult fish kidney regenerates by a stem cell–mediated process, creating new nephrons that fuse to existing branched collecting ducts.39 The consortium is taking genetic and pharmacologic approaches to manipulating cell signaling during this process and translating new insights to how nephrons can be directed to “plumb into” existing collecting duct networks. Understanding mechanisms of endogenous repair remains an important goal for regenerative nephrology. The consortium aims to understand cell-specific injury responses and the potential of adult progenitors to repair damaged kidney through regenerative processes. The proximal tubule epithelium has a robust capacity for repair after injury through the proliferative potential of surviving proximal tubule cells.2,3 A goal of the consortium is to determine whether dedifferentiation confers unique functional properties or tubulogenic potential on proximal tubule cells and to define the transcriptional profiles of these cells during the full course of repair. Cell types of particular interest include injured and dedifferentiated proximal tubule cells (defined by expression of Havcr1),40 interstitial pericytes and perivascular fibroblasts (defined by expression of Gli1),41 and cells of the renin lineage.42,43 These studies will also help inform efforts to generate high-quality kidney organoids by providing transcriptional snapshots of injured versus healthy proximal tubule cells. Adult podocytes are injured in many forms of glomerular diseases44 and show very little, if any, ability to self-replicate.4 However, there are two podocyte cell progenitor populations under study in the consortium: the glomerular parietal epithelial cells4,45,46 and cells of the renin lineage.42,43 Inducible reporter mice have enabled lineage tracing of both podocyte progenitor types under normal and experimental disease states. Isolation of each cell type is being performed to derive their transcriptional profiles with the goal of defining regulatory mechanisms controlling podocyte progenitor differentiation in health and disease. The cells will also be used to develop microfluidic “organs-on-chips,” to provide efficient, reproducible, and cost-effective multicellular cell culture models in native matrices.47 A goal of the consortium is to produce bioengineered three-dimensional microphysiologic flow-directed systems47,48 to recapitulate the glomerular filtration unit and provide a platform to examine replacement of depleted adult podocytes by local stem/progenitor cells: the glomerular parietal epithelial cells and cells of the renin lineage. The current composition of the consortium is described on the RBK website (www.rebuildingakidney.org). The consortium will continue to add new members and ideas through a Partnership Project Program administrated by the RBK coordinating center. Requests for applications in research areas that complement ongoing consortium studies will be announced annually. The coordinating center is a central data and resource repository for the consortium and the broader research community. On the basis of current consortium projects, the following types of data will be provided. Gene expression: RNA sequencing data will be uploaded to the National Center for Biotechnology Information Gene Expression Omnibus and links will be provided on the RBK website. In addition, the following will be archived and made publically available on the RBK website. Protocols: detailed protocols covering new methods developed in the RBK consortium. Examples include iPSC differentiation procedures, methods to generate biomaterials for use as scaffolds for kidney tissue, validation of quantitative PCR for marker genes to identify key cell types and stages of differentiation. Reagents: databases for growth factor and small molecule activities and concentrations as well as a list of validated antibodies will be maintained. Images: annotated micrographs, three-dimensional representations of tissue structures, in situ hybridization data, and chemical structures. Reporter iPSC lines: reporter lines are being generated from consortium-selected parent iPSC lines to enable the tagging of specific cell types for isolation and characterization. Once validated for pluripotency, genetic integrity, and appropriate reporter gene expression, these will be listed on the website. Whole genome sequencing data of the parent iPSC lines will be available on the website as an aid to design efficient genome editing strategies. This review provides a snapshot of the consortium in its present form. As the individual projects within the consortium progress, the focus of the program will evolve. Advances made during the initial phase will answer fundamental questions regarding human gene expression in the developing kidney, essential signaling crosstalk between distinct cell types of the developing kidney, how to derive the many cell types of the human kidney through directed differentiation, which scaffolding strategies have the most potential for kidney tissue formation in vitro, and basic parameters of the regenerative response to injury. In the next phase we anticipate focusing on physiologic function of in vitro and in vivo differentiated kidney tissue, systematic investigation of strategies for integration of urinary and vascular conduits between graft and host in experimental animal systems, and development of therapeutic approaches to promote innate reparative responses (Figure 4). Integration of vasculature, overcoming kidney fibrosis, and connecting bioengineered kidney tubules to the collecting system remain important challenges in advancing renal replacement therapy. The kidney vasculature represents a variety of unexplored endothelial cell subtypes that may affect nephron differentiation through reciprocal signaling events. (A) In the developing mouse kidney, vascular progenitor endothelial cells positive for Pecam (PE)/CD31(green) are intimately associated with the nephrogenic cortical fetal kidney domain populated by Six2-positive nephrogenic progenitor cells (red). E-cadherin (white) marks polarized epithelium of the branching ureter tips. Photo: Edward Daniel. (B) Kidney injury and fibrosis represents a major barrier to regeneration. Kidney injury recruits myofibroblasts, leading to fibrosis and CKD. Kim-1 immunostaining (green) identifies injured and dedifferentiated human proximal tubule whereas PDGFRb immunostaining reveals activated adjacent interstitial kidney fibroblasts (red). Photo: Monica Chang-Panesso and Farid Kadyrov. (C) Nephron interconnection is an essential process in generating a filtering kidney. New insights from the regenerating zebrafish kidney, where many new nephrons are added to the existing collecting system, can help define signaling pathways that stimulate cell rearrangements that lead to interconnected tubule lumens. The lhx1a:GFP transgene (green) marks new nephron cell projections, or invadopodia (arrowheads), that penetrate the collecting system as a prelude to interconnection. Photo: Caramai N. Kamei. CD, Collecting duct; nN, new nephron; blue fluorescence, DAPI nuclear stain. The following authors declare that they have no financial conflict of interest: B.D.H., C.J.K., C.K., D.K.H., D.L.K., D.R.G., I.A.D., J.A.H. J.A.W., J.R.S., L.O., M.T.V., O.C., O.W., S.J., S.J.S., T.J.C., and Y.Z. A.P.M. receives royalty income from Harvard University (Cambridge, MA) for licensing agreements around the Hedgehog pathway, and receives research support from Biogen (Cambridge, MA) on kidney disease mechanisms. J.J. owns stock in the following companies for activities as a founder and inventor: Alive Technologies Group, LLC (Cleveland, OH) and Trailhead Biosystems (Cleveland, OH). M.H.L. has received research contract income from and consulted for Organovo Inc (San Diego, CA). We would like to thank Allie Ware for designing Figure 1. Research reported in this publication is supported by the National Institutes of Health/National Institute of Diabetes and Digestive and Kidney Diseases under award numbers U01DK094526 (A.P.M. ), 1UH2DK107374 (B.D.H. ), R24DK106743 (O.C., D.L.K., L.O., and T.J.C. ), U01DK107350 (C.K., S.J.S., M.T.V., and S.J. ), UH2DK10732 (I.A.D. ), UH2DK107357 (J.J. and O.W. ), UH2DK107344 (M.H.L. ), DP3DK108215 (J.A.H. ), U01DK107350 (S.J. ), and UH2DK107343 (S.J.S. and Y.Z.). Research is also supported by the US Department of Veterans Affairs under award number I01BX002660 (J.A.W.). The content is solely the responsibility of the authors and does not necessarily represent the official views of either funding organization.